When I lived in the US, I watched a lot of Food Network. It was on a lot, sometimes just for some background noise in the house. Some people tune into shows to watch their favorite celebrity chefs: Bobby Flay, Barefoot Contessa, Nigella Lawson, Paula Deen, Giada…etc. We don’t have the luxury of American cable TV here in Shanghai. So who’s my new favorite celebrity chef? A dog. A talking dog, to be exact. His name is Francis. I actually tune into his channel on YouTube – Cooking with Dog. 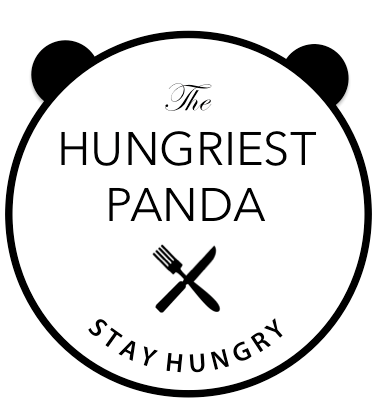 It’s a great show that teaches you how to make a wide range of Japanese dishes. Francis instructs a very skilled Japanese lady how to prep and cook all these dishes. Really a cute show and a fun channel to keep up with for lessons on Japanese homestyle cooking! The other day I was craving ketchup rice, a.k.a omurice in Japanese. Ever since I was little, my Dad has been the master at making it. I have always had it with Heinz ketchup as the main sauce for the fried rice but I saw Cooking with Dog had its own version. They make a tomato sauce for the base! Things. Just. Got. Interesting. Folks! Here’s how I put it together step by step. 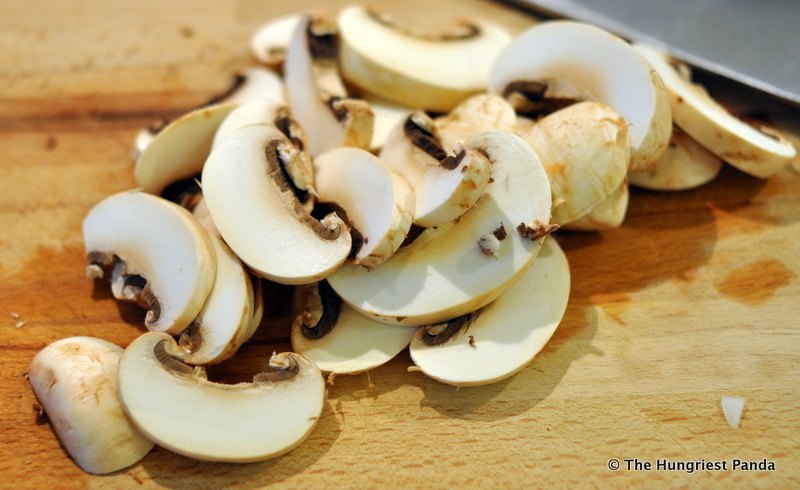 Slice up 4 button mushrooms…. 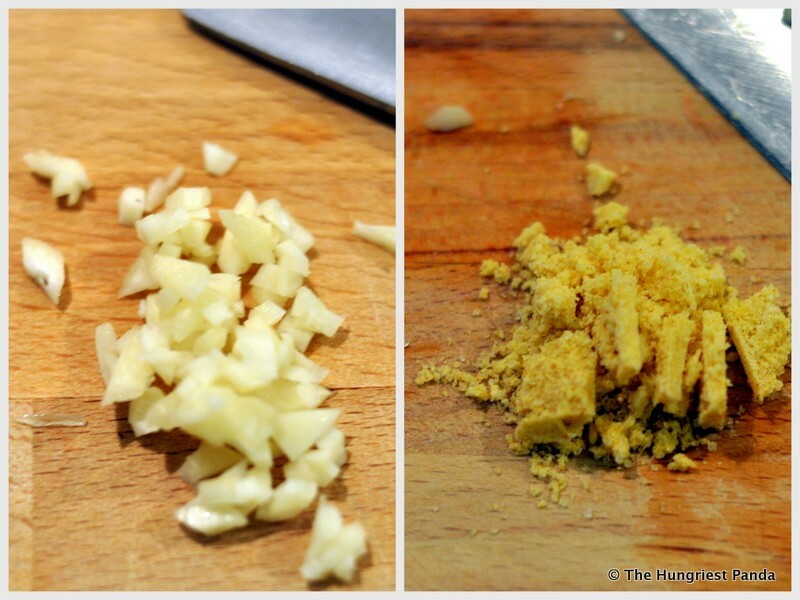 Chop up some garlic and half a chicken bouillon cube. 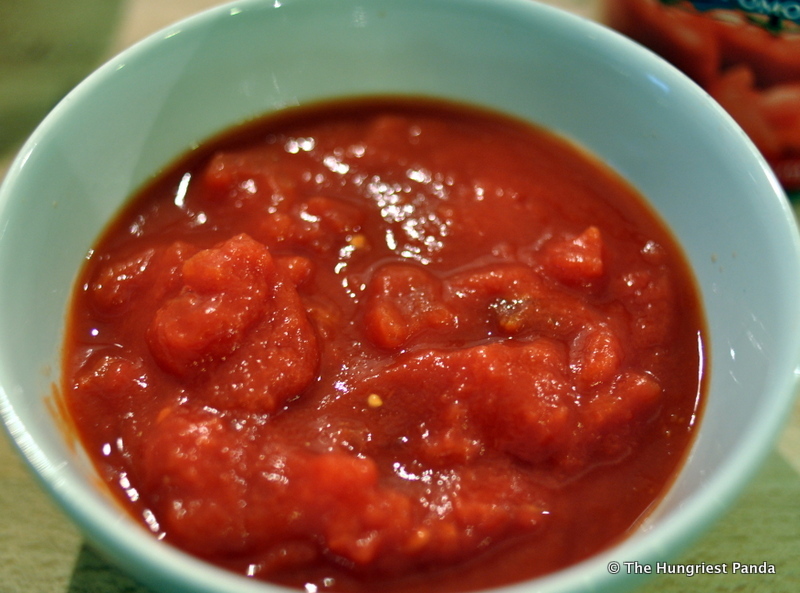 Measure out about half of a can of tomatoes and 1 tablespoon of ketchup.. 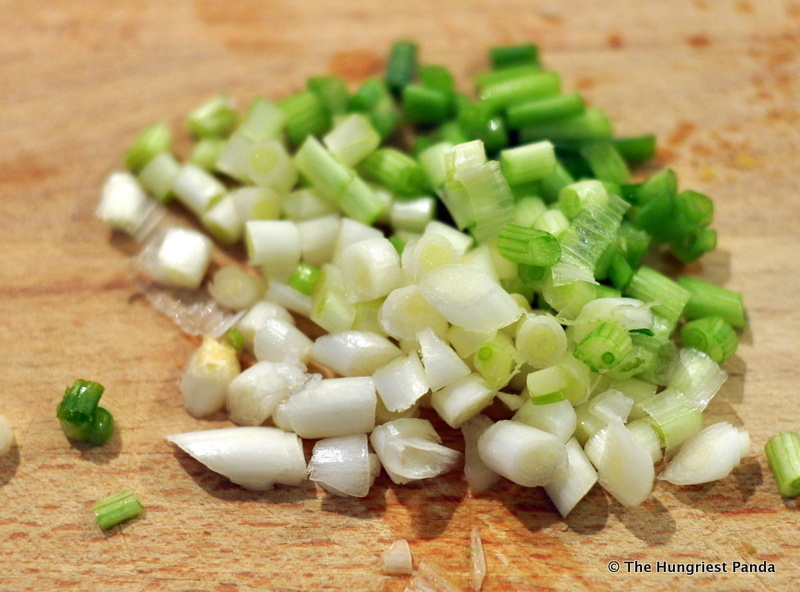 I had some extra green onions so I chopped that up and added it to the recipe. 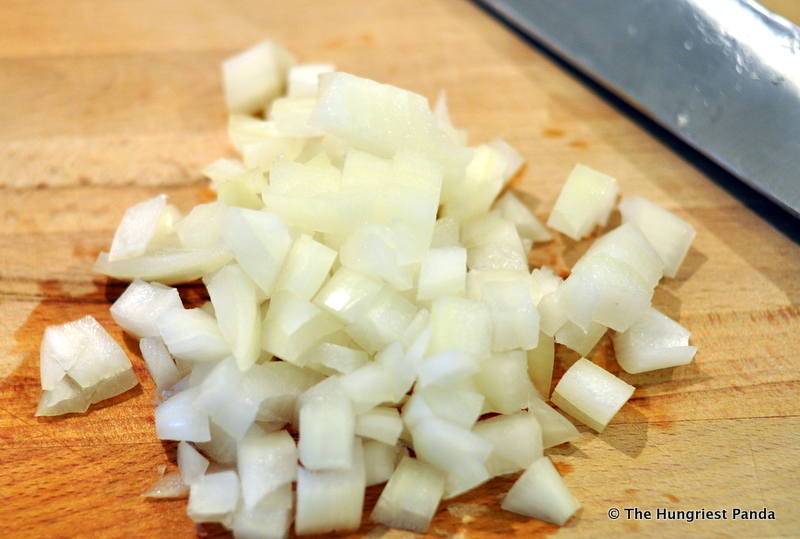 Grab a medium sized pan and heat the olive oil. 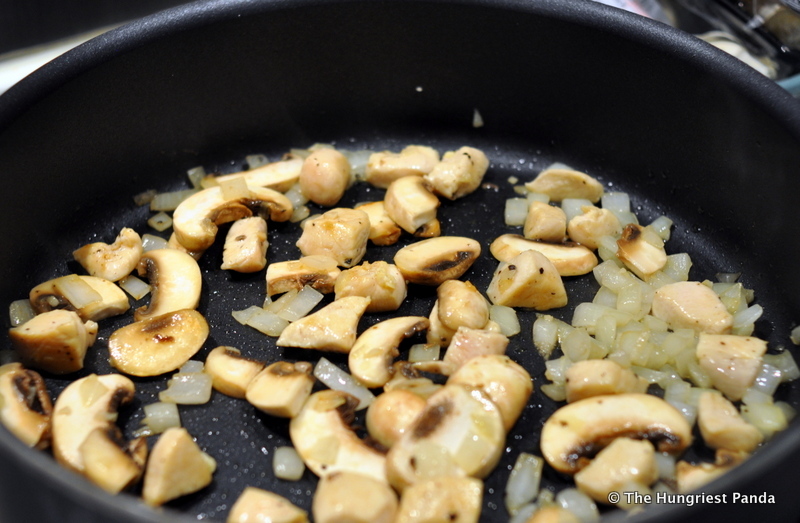 Start sautéing the onions and garlic until soft and then add the mushrooms. After about a minute add the chicken. Saute together until chicken is almost cooked through. Next add in the canned tomato, ketchup, bouillon cube, a tablespoon of sake and a bay leaf. Remove the bay leaf. 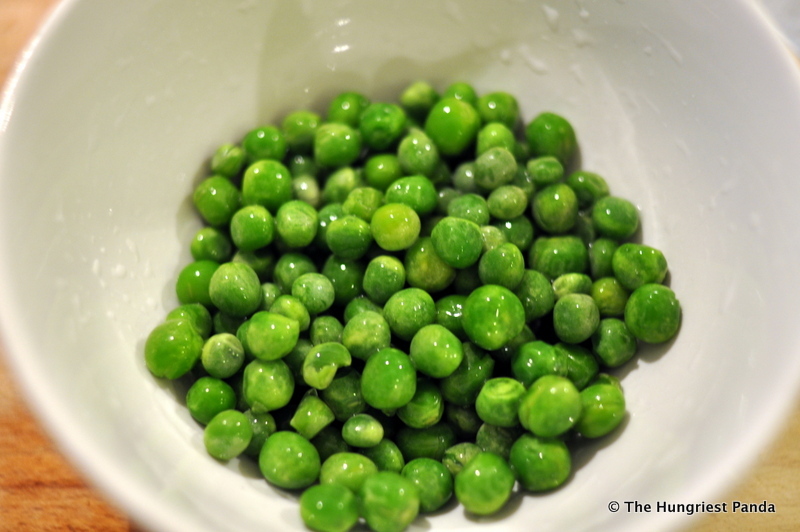 Add in the warm rice, green peas and green onions and season to taste with salt and pepper. 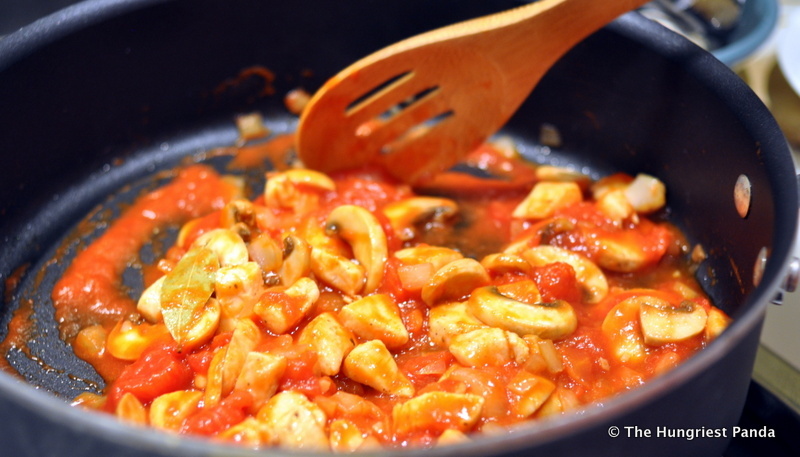 After throughly mixed, remove from pan and set aside. Get ready to make the egg. 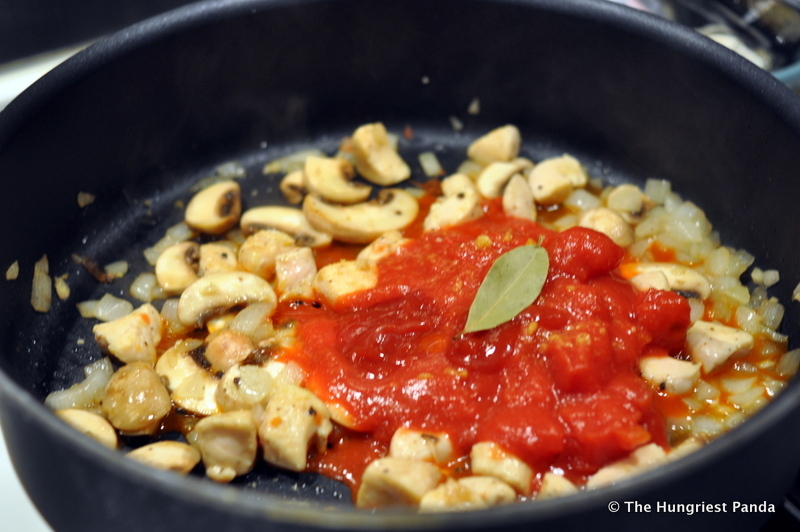 Add olive oil to the pan and set heat to medium. Beat two eggs and some milk, salt and pepper. When the oil is heated, add the egg as if you’re making an omelette by swirling the egg around to cover the bottom of the pan. 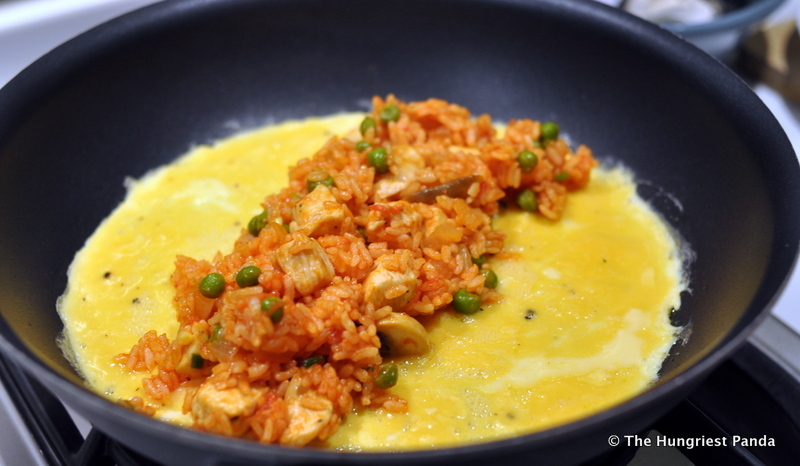 Allow egg to cook almost through and add rice in the center of the omelette. 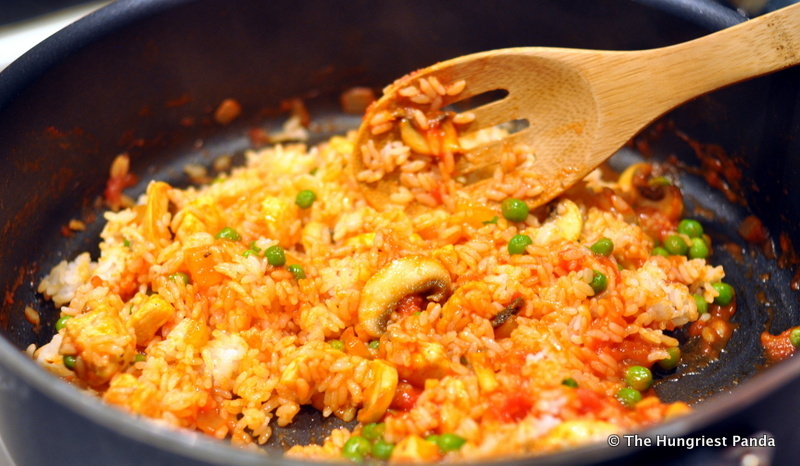 Fold edges around the rice and slide to one side of the pan. Flip the pan over a plate and then using a paper towel shape the omelette rice, making sure all the edges are tucked under. Finish with some ketchup on top. Ketchup or tomato sauce with your fried rice might seem like a strange ingredient if you’ve never had omurice before, but it really goes well together. There is a tangy, salty-sweetness to the rice that when wrapped in a warm omelet makes for perfect comfort food. This recipe is a tasty, simple, quick meal that could be made from ingredients probably already in your pantry or refrigerator. Some steamed broccoli or a small side salad works great as a side. 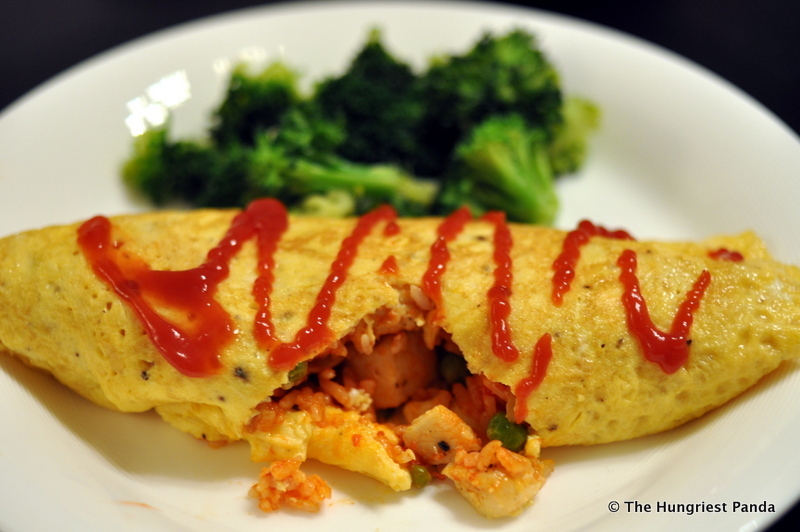 Omurice is popular in Japan and Korea in many casual western fusion-style cafes.